Mount does not come with tripod or counter weight. Only $34.99 ! ! ! PLEASE NOTE: Mount head does not come with tripod, counter weight, counter weight shaft or slow motion cables! What you see in the photo is what you will receive. If you need a complete mount do not purchase this item. We have complete mounts listed in our eBay store. Celestron CG-2 provides solid support for many small telescopes. Same as SkyWatcher and Orion EQ-1. This mount works great with 90mm Maksutov, short 80mm refractor, Coronado Personal Solar Telescope, short 114mm reflector, 60mm or 70mm refractor. 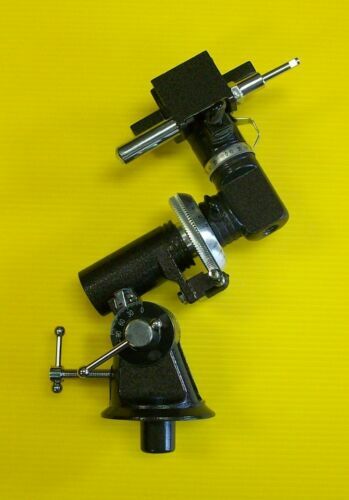 Exact same mount as Orion EQ-1 equatorial telescope mount. Hands-free tracking is available with the optional motor drive ($34.99). Capable of managing telescopes and equipment combinations weighing up to seven pounds. Shipping & Handling fee is based on your location.